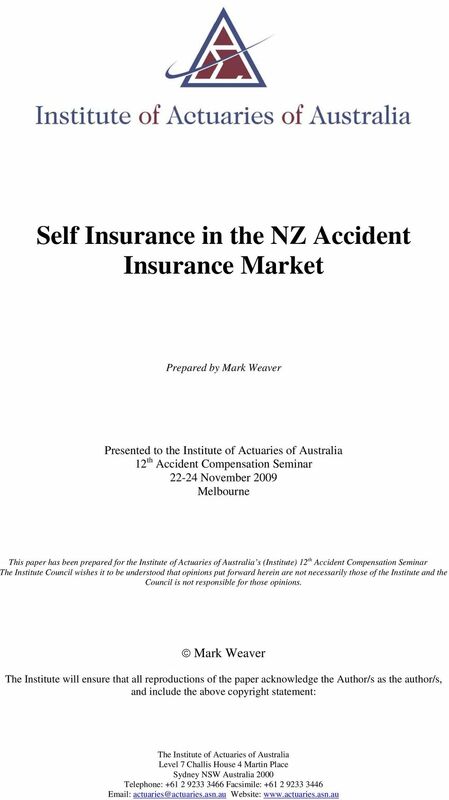 Download "Self Insurance in the NZ Accident Insurance Market"
3 Self Insurance in the NZ Accident Insurance Market Page 1 1. Summary and conclusions 1.1 Introduction The New Zealand Accident Insurance Scheme is entering a period which will see significant changes. 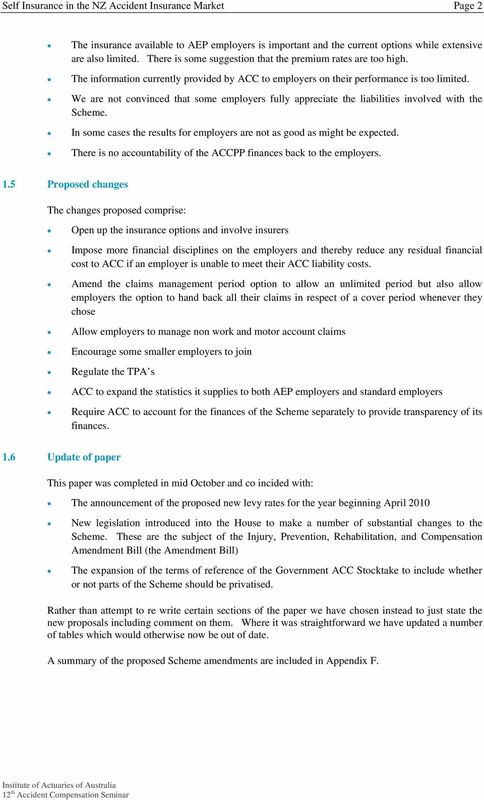 The Government has stated that there will be tighter rules on benefit entitlements and rolling back of some of the expansion in benefits seen since July While comprising only 13% of the levy income for the ACC for the 2008/09 year, the Work Account plays a dominant role in the Scheme and within this exists the ACC Partnership Programme (ACCPP), the self insurance option open to employers (the AEP employers). This paper: Reviews and assesses the current ACCPP Identifies areas where we see opportunities to improve the ACCPP Explores options to implement possible changes. It is not intended that the paper discuss the changes that may come about as a consequence of the current Government review. 1.2 Sources of data The information in this paper is taken from a number of sources including publically available ACC reports. It is important to note here how over the years ACC has always been willing to discuss issues and provide information on request. The input we have received from the Third Party Administrators (TPA s), who administer the claims for the employers, and the discussions we have had with employers have been valuable. Thanks to Janet Lockett who completed the peer reviewing of this paper, her input was invaluable. 1.3 Main features of the ACCPP These are: The ACCPP covers 22% of employees An employer who selects the Full Self Cover Plan assumes 100% liability, limited only by the stop loss insurance The limited claims management period - up to a maximum of 4 years after the cover period The very defined and structured nature of the Scheme The significant role played by the TPA s The important role played by auditors. 1.4 Assessing the Scheme The assessment is: It is important to provide employers with incentives to improve their health and safety, reduce accidents, and improve rehabilitation of injured workers. Overall the ACCPP achieves this. However, there are some important areas where changes could be made to improve outcomes and commitment from employers. 4 Self Insurance in the NZ Accident Insurance Market Page 2 The insurance available to AEP employers is important and the current options while extensive are also limited. There is some suggestion that the premium rates are too high. The information currently provided by ACC to employers on their performance is too limited. We are not convinced that some employers fully appreciate the liabilities involved with the Scheme. In some cases the results for employers are not as good as might be expected. There is no accountability of the ACCPP finances back to the employers. 1.5 Proposed changes The changes proposed comprise: Open up the insurance options and involve insurers Impose more financial disciplines on the employers and thereby reduce any residual financial cost to ACC if an employer is unable to meet their ACC liability costs. Amend the claims management period option to allow an unlimited period but also allow employers the option to hand back all their claims in respect of a cover period whenever they chose Allow employers to manage non work and motor account claims Encourage some smaller employers to join Regulate the TPA s ACC to expand the statistics it supplies to both AEP employers and standard employers Require ACC to account for the finances of the Scheme separately to provide transparency of its finances. 1.6 Update of paper This paper was completed in mid October and co incided with: The announcement of the proposed new levy rates for the year beginning April 2010 New legislation introduced into the House to make a number of substantial changes to the Scheme. These are the subject of the Injury, Prevention, Rehabilitation, and Compensation Amendment Bill (the Amendment Bill) The expansion of the terms of reference of the Government ACC Stocktake to include whether or not parts of the Scheme should be privatised. Rather than attempt to re write certain sections of the paper we have chosen instead to just state the new proposals including comment on them. Where it was straightforward we have updated a number of tables which would otherwise now be out of date. A summary of the proposed Scheme amendments are included in Appendix F.
5 Self Insurance in the NZ Accident Insurance Market Page 3 2. Overview of the New Zealand Accident Insurance Scheme 2.1 Introduction The paper commences with information on the basic New Zealand Accident Insurance scheme and the ACCPP. The Scheme is governed by the Injury Prevention, Rehabilitation and Compensation Act 2001 (the Act). The Ministry responsible for managing the Accident and Insurance Corporation (ACC) is the Department of Labour. ACC is the Crown entity which provides the cover under the Act. 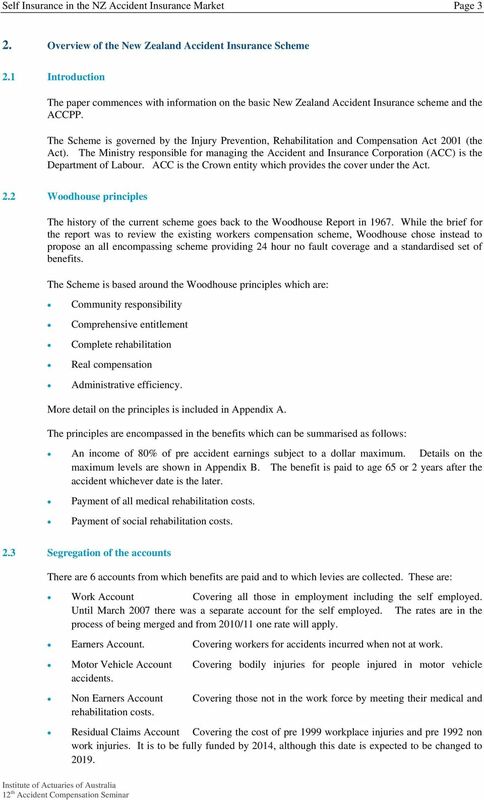 2.2 Woodhouse principles The history of the current scheme goes back to the Woodhouse Report in While the brief for the report was to review the existing workers compensation scheme, Woodhouse chose instead to propose an all encompassing scheme providing 24 hour no fault coverage and a standardised set of benefits. The Scheme is based around the Woodhouse principles which are: Community responsibility Comprehensive entitlement Complete rehabilitation Real compensation Administrative efficiency. More detail on the principles is included in Appendix A. The principles are encompassed in the benefits which can be summarised as follows: An income of 80% of pre accident earnings subject to a dollar maximum. Details on the maximum levels are shown in Appendix B. The benefit is paid to age 65 or 2 years after the accident whichever date is the later. Payment of all medical rehabilitation costs. Payment of social rehabilitation costs. 2.3 Segregation of the accounts There are 6 accounts from which benefits are paid and to which levies are collected. These are: Work Account Covering all those in employment including the self employed. Until March 2007 there was a separate account for the self employed. The rates are in the process of being merged and from 2010/11 one rate will apply. Earners Account. Covering workers for accidents incurred when not at work. Motor Vehicle Account Covering bodily injuries for people injured in motor vehicle accidents. Non Earners Account Covering those not in the work force by meeting their medical and rehabilitation costs. Residual Claims Account Covering the cost of pre 1999 workplace injuries and pre 1992 non work injuries. It is to be fully funded by 2014, although this date is expected to be changed to 2019. 6 Self Insurance in the NZ Accident Insurance Market Page 4 Treatment Injury Account This covers the cost of personal injuries from medical treatment. The 6 accounts were established as part of the reforms in the 1990 s. The culmination of the reforms was the privatisation of the then Employers Account with the self employed having the option to seek a private insurer, from July 1999 to June A major driver for the separation of the accounts was the need to properly account for the cost of the benefits provided. Without this information it would not be possible to address cost pressures in particular areas. At the current time this is very relevant with the Earners Account experiencing large cost increases. 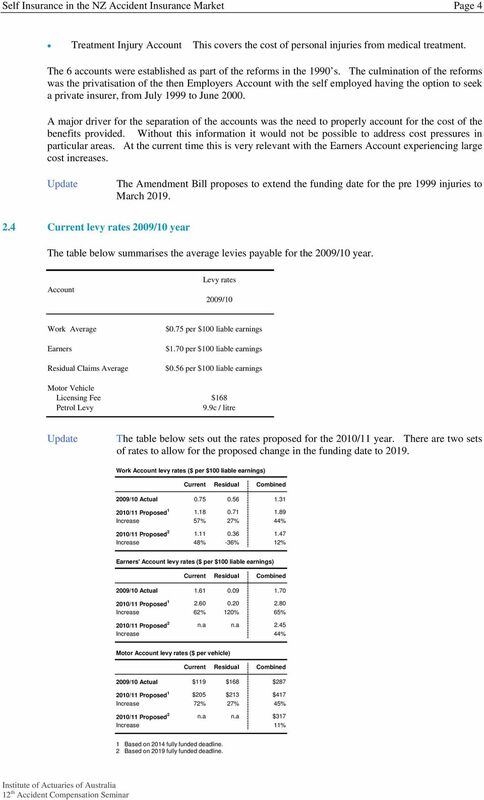 Update The Amendment Bill proposes to extend the funding date for the pre 1999 injuries to March Current levy rates 2009/10 year The table below summarises the average levies payable for the 2009/10 year. Account Levy rates 2009/10 Work Average Earners Residual Claims Average $0.75 per $100 liable earnings $1.70 per $100 liable earnings $0.56 per $100 liable earnings Motor Vehicle Licensing Fee $168 Petrol Levy 9.9c / litre Update The table below sets out the rates proposed for the 2010/11 year. There are two sets of rates to allow for the proposed change in the funding date to Work Account levy rates ($ per $100 liable earnings) Current Residual Combined 2009/10 Actual /11 Proposed Increase 57% 27% 44% 2010/11 Proposed Increase 48% -36% 12% Earners' Account levy rates ($ per $100 liable earnings) Current Residual Combined 2009/10 Actual /11 Proposed Increase 62% 120% 65% 2010/11 Proposed 2 n.a n.a 2.45 Increase 44% Motor Account levy rates ($ per vehicle) Current Residual Combined 2009/10 Actual $119 $168 $ /11 Proposed 1 $205 $213 $417 Increase 72% 27% 45% 2010/11 Proposed 2 n.a n.a $317 Increase 11% 1 Based on 2014 fully funded deadline. 2 Based on 2019 fully funded deadline. 7 Self Insurance in the NZ Accident Insurance Market Page 5 The changes are substantial. 2.5 Separate Health and Safety Agency The responsibility for health and safety in the workplace lies with OSH, which works out of the Department of Labour. It completes audits, promotes health and safety initiatives and investigates accidents. At the same time, the Act requires ACC to promote injury prevention. The estimated expenditure of OSH on health and safety was $47 million for the 2007 year. ACC injury prevention costs for the 2008 year were $39.82 million, down from the 2007 figure of $40.01 million. In 2002 the ACC expenditure was $18.54 million. There is possibly scope for some rationalisation in the roles, although the health and safety role is separate to injury prevention. Overall there is a sense that New Zealand could spend more on injury prevention. 2.6 Stocktake of ACC Accounts ACC is going through a period of major change following the election of the new National Government. The Government has set up a stocktake to provide information on which to base future decisions to improve the efficiency and affordability of the Scheme. The work involved is likely to include: Assessing the performance of each of the ACC accounts. This will include such matters as: Determining whether there are any cross subsidies between the accounts Funding options Identifying the cost drivers and strategies to address The risks involved in each account, who bears them and options for managing them Reviewing the performance of the monitoring agency, namely the Department of Labour Assessment of current employer programmes and incentives to encourage more workplace safety, whether the employers could manage and pay for non work accidents to promote rehabilitation. Reviewing the ACCPP would form part of this work stream. Review of the current investment portfolio Review of the key changes in legislation over time and their impact on claimant entitlement. Update The Stocktake will now include a review of whether parts of the Scheme should be privatised. 8 Self Insurance in the NZ Accident Insurance Market Page 6 3. Overview of the Self Insurance option 3.1 Introduction The history of the ACCPP goes back to the initiatives in the 1990 s to introduce experience rating for the larger employers. 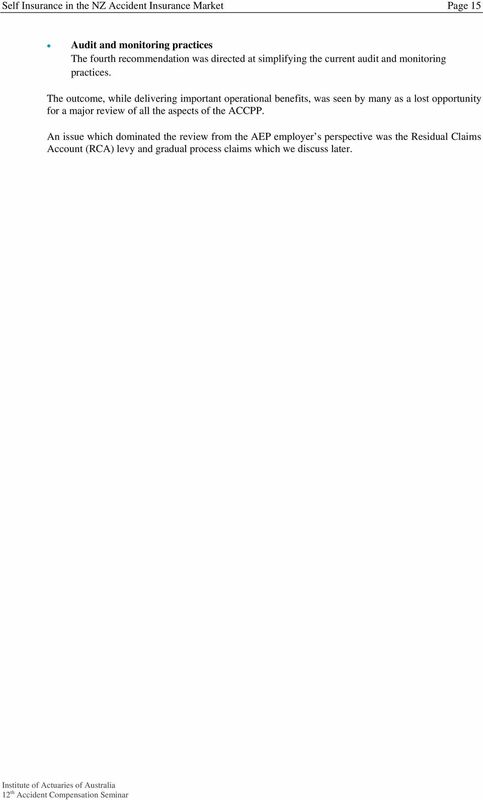 (We refer to the employers in the ACCPP as Accredited Employers (AEP employers)). The current self insurance scheme has been in place since July 2000 when the insurance of workplace accidents returned to ACC after the privatisation year. The Scheme has changed very little since then. Some basic numbers on the scheme are: The number of AEP employers has dropped from 182 to currently 136 but there has been only a small drop in number of employees covered. Much of the drop has been due to the amalgamation of employers. There are 2 versions of the scheme, see section 4.8 below. 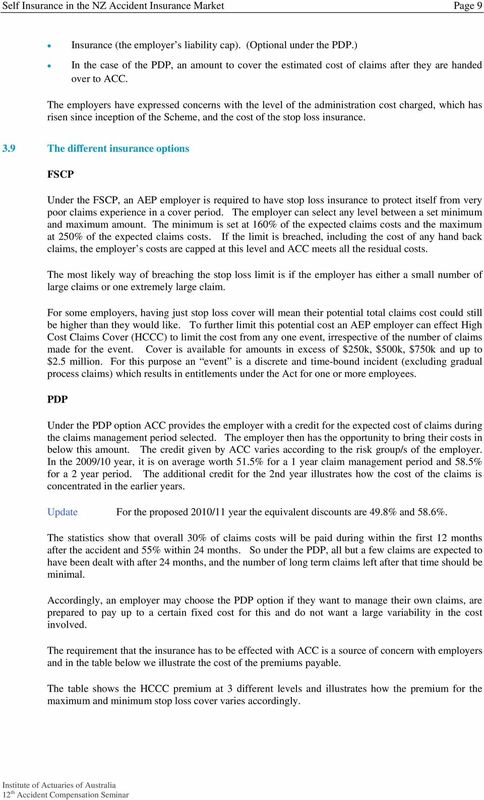 These are the Full Self Cover Plan (FSCP) and the Partnership Discount Plan (PDP): Number in FSCP 97 Number in PDP 39 Workers covered 22% The estimated cost of claims in the ACCPP for the 2010/11 year is around $150 million. 3.2 Why the ACCPP is so important The ACCPP is about more than just self insurance. How the self insurance scheme is set up potentially impacts on the rest of the ACC Scheme. It is a question of using the resources and energies of the large employers to set high standards that the rest of the market is motivated to follow. It is hard to argue against the proposition that the employer is in the best position to rehabilitate an injured worker. They have some financial incentive to achieve a satisfactory return to work by their employee. Most observers would agree that, in most cases, assisting an injured worker to get back into their workplace as soon as possible to do some form of work is better than the alternative of having them at home while looking to get better. The best example is putting an employee on light duties to speed their recovery. From the employer perspective, having the employee on light duties will limit the need to employ another temporary person to take up the work load of the injured worker. While some might argue that the extent to which this can be done in practice will vary with the size of an organisation, it is also possible in a small workplace. At the same time the regime needs to protect injured workers from an employer cutting corners when rehabilitating a worker and /or not recognising an accident when it is the case. Achieving lower accident costs incentivises the employer to invest in good health and safety practices in the work place. As this paper shows, the statistics tend to confirm that most participating employers benefit from being in the ACCPP. Once in the programme, most employers find the prospect of handing over the future management of their employee claims to ACC difficult to contemplate, but at the same time, if the sums suggest this is the best option, they will do it. However, whether an employer is in or out of the programme is a financial decision. 3.3 Obligations of ACC and an accredited employer The prime obligation of an AEP employer is to perform the functions and duties and exercise the powers of ACC as if ACC was itself managing the claim. There are some limitations on the employers powers. For example, in regard to a claimant who has sought a review of a decision, the employer cannot appeal an adverse outcome of a cover decision of the review - this is for ACC to decide. An employer can appeal a benefit entitlement decision. 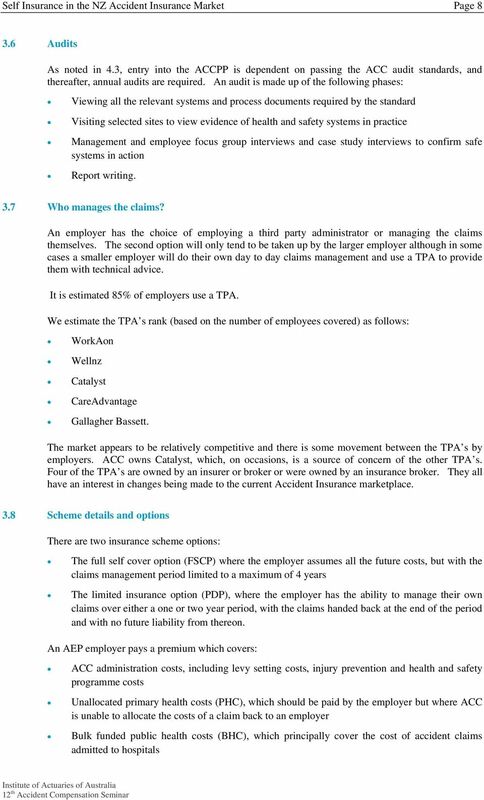 9 Self Insurance in the NZ Accident Insurance Market Page 7 While the TPA s play a major role, the responsibility for all decisions lie with the employer and not the TPA. 3.4 Criteria for joining To join the ACCPP an employer must: Demonstrate long-term financial stability and the ability to meet the cost of work-related injuries Have active workplace safety systems and processes in place Have active injury management procedures in place, including claims administration and rehabilitation support Demonstrate the involvement of employees and their representatives in workplace safety Meet the ACCPP audit standards for workplace safety and injury management and be able to demonstrate a commitment to injury prevention. ACC states that the ACCPP is more suitable for large employers whose levies exceed $150,000 per annum. Update The equivalent level would now be $225,000 plus. While there is a one page application form, the process involves: Satisfactorily completing the ACC audits Passing a financial audit. The financial audit is completed by an outside accounting firm and is to ensure that the employer can meet their financial commitments under the programme. To date we understand that 2 employers have left the ACCPP due to adverse financial circumstances. 3.5 WMSP Any employer can apply to ACC for a Workplace Management Safety Programme (WMSP) discount. 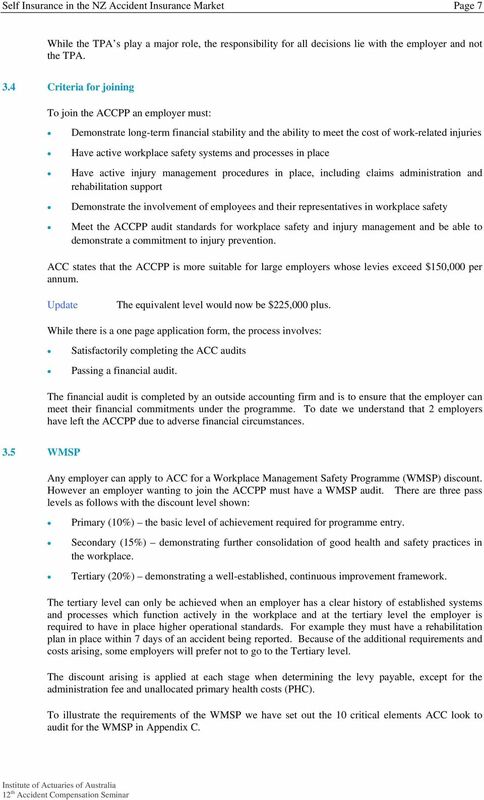 However an employer wanting to join the ACCPP must have a WMSP audit. There are three pass levels as follows with the discount level shown: Primary (10%) the basic level of achievement required for programme entry. Secondary (15%) demonstrating further consolidation of good health and safety practices in the workplace. Tertiary (20%) demonstrating a well-established, continuous improvement framework. The tertiary level can only be achieved when an employer has a clear history of established systems and processes which function actively in the workplace and at the tertiary level the employer is required to have in place higher operational standards. For example they must have a rehabilitation plan in place within 7 days of an accident being reported. Because of the additional requirements and costs arising, some employers will prefer not to go to the Tertiary level. The discount arising is applied at each stage when determining the levy payable, except for the administration fee and unallocated primary health costs (PHC). 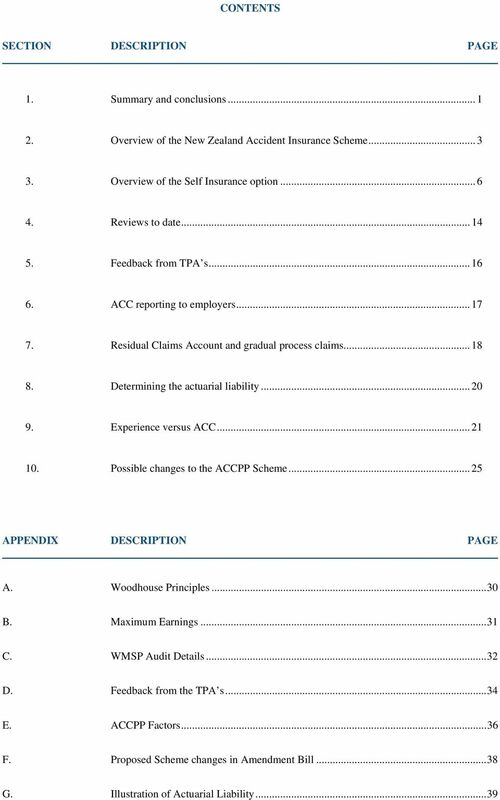 To illustrate the requirements of the WMSP we have set out the 10 critical elements ACC look to audit for the WMSP in Appendix C.
11 Self Insurance in the NZ Accident Insurance Market Page 9 Insurance (the employer s liability cap). (Optional under the PDP.) In the case of the PDP, an amount to cover the estimated cost of claims after they are handed over to ACC. The employers have expressed concerns with the level of the administration cost charged, which has risen since inception of the Scheme, and the cost of the stop loss insurance. 3.9 The different insurance options FSCP Under the FSCP, an AEP employer is required to have stop loss insurance to protect itself from very poor claims experience in a cover period. The employer can select any level between a set minimum and maximum amount. The minimum is set at 160% of the expected claims costs and the maximum at 250% of the expected claims costs. If the limit is breached, including the cost of any hand back claims, the employer s costs are capped at this level and ACC meets all the residual costs. The most likely way of breaching the stop loss limit is if the employer has either a small number of large claims or one extremely large claim. For some employers, having just stop loss cover will mean their potential total claims cost could still be higher than they would like. To further limit this potential cost an AEP employer can effect High Cost Claims Cover (HCCC) to limit the cost from any one event, irrespective of the number of claims made for the event. Cover is available for amounts in excess of $250k, $500k, $750k and up to $2.5 million. For this purpose an event is a discrete and time-bound incident (excluding gradual process claims) which results in entitlements under the Act for one or more employees. PDP Under the PDP option ACC provides the employer with a credit for the expected cost of claims during the claims management period selected. The employer then has the opportunity to bring their costs in below this amount. The credit given by ACC varies according to the risk group/s of the employer. In the 2009/10 year, it is on average worth 51.5% for a 1 year claim management period and 58.5% for a 2 year period. The additional credit for the 2nd year illustrates how the cost of the claims is concentrated in the earlier years. Update For the proposed 2010/11 year the equivalent discounts are 49.8% and 58.6%. The statistics show that overall 30% of claims costs will be paid during within the first 12 months after the accident and 55% within 24 months. So under the PDP, all but a few claims are expected to have been dealt with after 24 months, and the number of long term claims left after that time should be minimal. Accordingly, an employer may choose the PDP option if they want to manage their own claims, are prepared to pay up to a certain fixed cost for this and do not want a large variability in the cost involved. The requirement that the insurance has to be effected with ACC is a source of concern with employers and in the table below we illustrate the cost of the premiums payable. 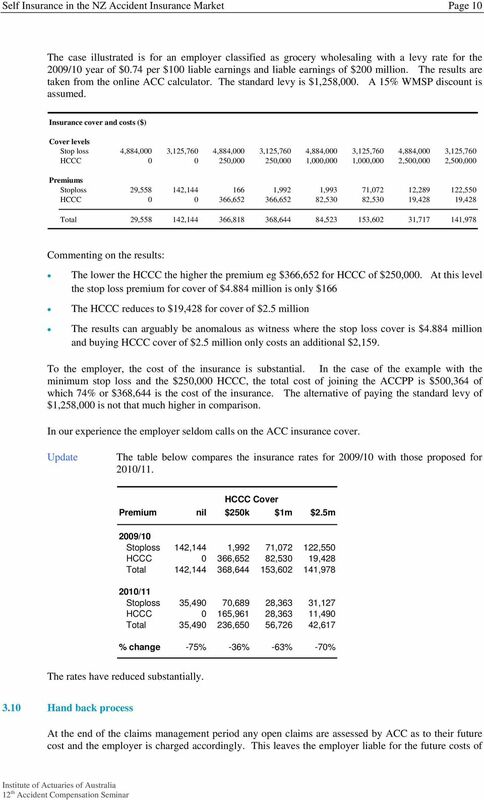 The table shows the HCCC premium at 3 different levels and illustrates how the premium for the maximum and minimum stop loss cover varies accordingly. 13 Self Insurance in the NZ Accident Insurance Market Page 11 all claims which have not been assessed by ACC. The basis for a claim to be assessed by ACC is if a payment has been made at any time within the last 6 months. Information on the claims handed back in the year ended 31 March 2009 shows that there were slightly less than 150 FSCP claims handed back and around 120 PDP claims. The total claims costs involved totalled $6.3 million, with the largest 12 claims costing $5.3 million. The numbers in 2008 were similar. Once a claim has been assessed, even for a nil cost, the employer s future liability for that claim is nil. The hand back process involves a high level of input from ACC and we later question whether there are alternatives to the current approach. A further point here is the question of how good in total is ACC with their case estimates and costs charged to employers. It would be informative to employers if ACC accounted for the cost of these claims separately Monthly data sent to ACC Each month the AEP employer sends claim details through to ACC in an agreed format. The reporting required is extensive and is intended to mirror ACC s own internal reporting. We have found in our work that, on occasions, the data held by ACC in respect of an employer is different to that held by the employer. It would be useful if ACC was able to report back to employers immediately summarising the information they have received and asking for confirmation that this is correct. It is important to have full, comprehensive and correct data on the claims Costs of the Programme and the discounts applying for the PDP The administration charges and those for the PHC and BHC for the 2009/10 year are shown below. Except for the administration charge the fees are expressed as a % of the standard levy net of WSMP: The administration fee does not include the discount. Update The rates shown in brackets are those proposed for the 2010/11 year. The reduction follows from the increase in the proposed standard levy rates. Administration 4% (2.3%) Bulk Health Costs 4% (1.5%) Primary Health Costs 1.5% (2.8%) The bulk health and primary health costs are therefore just reflecting the costs that would otherwise apply if the AEP employer was paying the standard levy. This is shown further in the table below which gives a full breakdown of the costs for the standard employer and for the PDP as they applied for the 2008/09 year and shows the average discount for the PDP applying. 14 Self Insurance in the NZ Accident Insurance Market Page 12 The table is taken from the ACC Actuarial Pricing Document Average ACC Partnership Discount Plan Discounts Claims Management Period Subsequent to Cover Period Standard Employers 1yr 2yr Direct Claim Costs 0.71% 0.31% 0.25% Bulk-Billed Claim Costs 0.03% 0.03% 0.03% Claims Handling Expense 0.08% 0.03% 0.02% Administration Expense 0.03% 0.00% 0.00% Levy Collection Costs 0.03% 0.00% 0.00% Provision for Doubtful Debts 0.01% 0.01% 0.01% Reserve Adjustment -0.24% -0.06% -0.03% Levy Stability Adjustment 0.00% 0.00% 0.00% Net Average Employer work levy rate 0.65% 0.32% 0.28% Workplace Safety Management Practices Discount Funding 0.02% 0.02% 0.02% Employers Average Work Levy Rate 0.67% 0.34% 0.30% Partnership Discount Plan Discount 50.80% 56.90% Commenting on the results: The cost for the standard employer is $0.67 per $100 liable earnings The costs for an employer in the 1 and 2 year PDP are $0.34 and $0.30 respectively The discounts that will apply to the PDP are therefore 50.8% and 56.9% Standard levy rates since 2003 While the larger employers in the ACCPP will be clear about belonging to the scheme, this is not the case for the smaller ones who will monitor the attractiveness of the ACCPP compared to the alternative of paying the standard levy. The choice was made more difficult by the reduction in the rates commencing April The table below shows the average annual levy rates charged with the reductions from April 2007 for the impact of the surplus in the Work Account clearly shown. The table is taken the ACC Consultation Document September 2008. 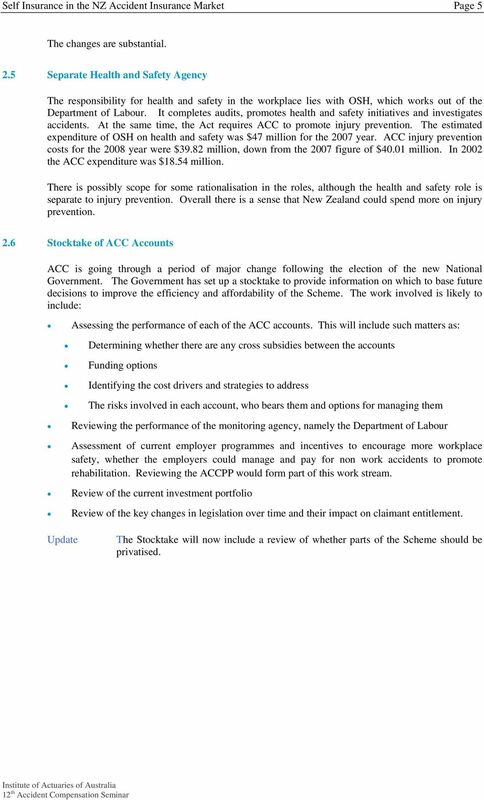 15 Self Insurance in the NZ Accident Insurance Market Page 13 The most interesting aspect of the table is the expected increase in rates through to This will have a favourable impact on the ACCPP making it more attractive for the smaller employers. 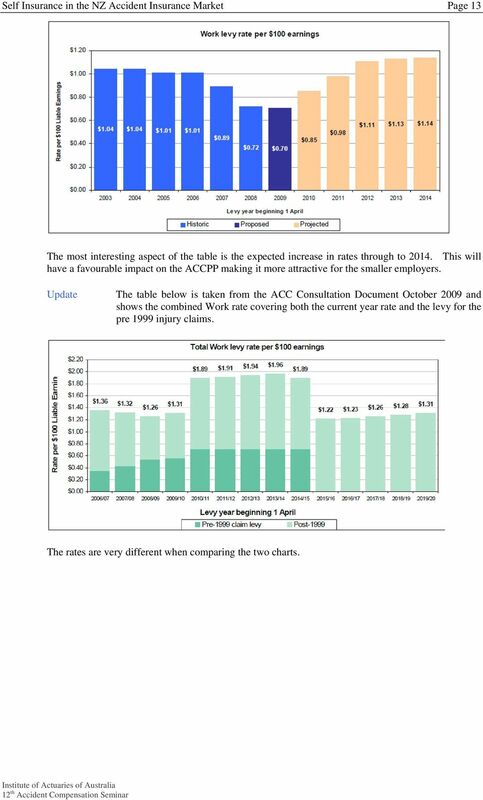 Update The table below is taken from the ACC Consultation Document October 2009 and shows the combined Work rate covering both the current year rate and the levy for the pre 1999 injury claims. The rates are very different when comparing the two charts. 16 Self Insurance in the NZ Accident Insurance Market Page Reviews to date 4.1 Introduction We have identified two reviews, the 2003 Deloitte Review and the Tripartite Review completed in Deloitte review This was completed in November It was commissioned by ACC itself and was supportive of the AEP employers. The primary purpose was to determine how well the ACCPP was operating since its introduction in It was an operational review and consulted with the stakeholders of the ACCPP. The main issues identified by each stakeholder were: ACC To build accredited employer capacity to make workplaces safer AEP employers Effort required for audits and the application of the audit tool Unions Believe employee participation is unsatisfactory TPA s Frustrated at lack of recognition by ACC of the role TPA s play Auditors Require specific industry knowledge and alignment of the audit tool with OSH requirements Employees Prefer their employer to be involved in injury management rather than ACC. These views are not dissimilar to those currently expressed. Possibly of most interest is the view expressed by the AEP employers. Exploring why this was the case and whether it is still the case would be useful when considering expanding the role of the employers to manage non work claims. ACC is a very political subject and the unions are rightly interested in the area. Comments have been made that the unions do not have enough proper experience in ACC to play a full role in the work place - although Ross Wilson, ex CTU President and ex Chair of ACC, was active in improving their resources in this area. 4.3 Tripartite review The Tripartite review was organised by ACC and was an operational review. The contributing organisations to the review were ACC, NZCTU, Business NZ and the Department of Labour. The Department of Labour had been planning its own review which was expected to review all the aspects of design and operation of the ACCPP. However this was overtaken by the Tripartite review. It contained 4 recommendations and was very much focussed on improving the day to ay operation of the ACCPP. Best practice guidance The report recommended that new entrants to the ACCPP be given more information on what constitutes best practice. Development and training The report recommended more training and providing information on the different legislation under the Health and Safety in Employment Act, the Employment Relations Act and the Injury Prevention, Rehabilitation, and Compensation Act. Data gathering to develop performance benchmarks This recommendation addressed the need for more benchmarks to assist an employer assess their performance. 17 Self Insurance in the NZ Accident Insurance Market Page 15 Audit and monitoring practices The fourth recommendation was directed at simplifying the current audit and monitoring practices. The outcome, while delivering important operational benefits, was seen by many as a lost opportunity for a major review of all the aspects of the ACCPP. An issue which dominated the review from the AEP employer s perspective was the Residual Claims Account (RCA) levy and gradual process claims which we discuss later. 18 Self Insurance in the NZ Accident Insurance Market Page Feedback from TPA s 5.1 Role of the TPA s The TPA s play an important role managing claims on behalf of the employers and are in a position to form a view on improvements that could be made to the ACCPP. 5.2 Feedback from TPA s We sent a questionnaire to the 5 TPA s and we received responses from 4. We have summarised the answers below. It s a good programme which encourages good responses from employers to health and safety and rehabilitation. Too limited insurance options Dual standards. ACCPP clients required to meet far higher standards than ACC itself. Should have open ended claims management period. The audit process should move to a continuous improvement model rather than compliance driven. Allow employers to manage non-work claims Separate out the ACC regulatory role Does not currently allow for innovation by employers. 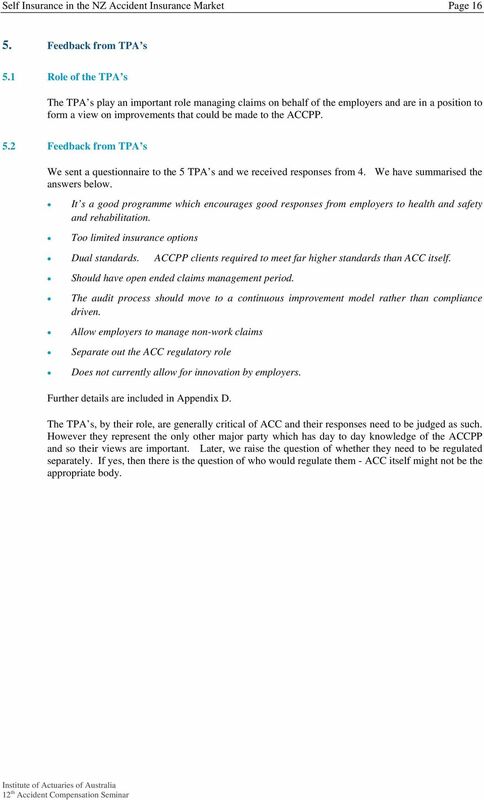 Further details are included in Appendix D. The TPA s, by their role, are generally critical of ACC and their responses need to be judged as such. However they represent the only other major party which has day to day knowledge of the ACCPP and so their views are important. Later, we raise the question of whether they need to be regulated separately. If yes, then there is the question of who would regulate them - ACC itself might not be the appropriate body. 19 Self Insurance in the NZ Accident Insurance Market Page ACC reporting to employers 6.1 Report introduced in 2008 In 2008 ACC introduced a new ACC Partnership Programme Employer Performance Report. The report was effective March 2008 and another is due in late The report includes some important information for employers although we are not convinced that all employers fully appreciate the content. 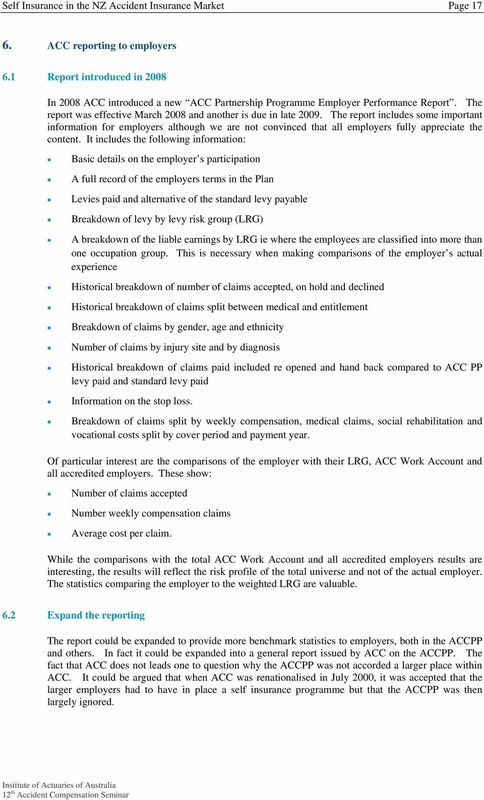 It includes the following information: Basic details on the employer s participation A full record of the employers terms in the Plan Levies paid and alternative of the standard levy payable Breakdown of levy by levy risk group (LRG) A breakdown of the liable earnings by LRG ie where the employees are classified into more than one occupation group. This is necessary when making comparisons of the employer s actual experience Historical breakdown of number of claims accepted, on hold and declined Historical breakdown of claims split between medical and entitlement Breakdown of claims by gender, age and ethnicity Number of claims by injury site and by diagnosis Historical breakdown of claims paid included re opened and hand back compared to ACC PP levy paid and standard levy paid Information on the stop loss. Breakdown of claims split by weekly compensation, medical claims, social rehabilitation and vocational costs split by cover period and payment year. Of particular interest are the comparisons of the employer with their LRG, ACC Work Account and all accredited employers. These show: Number of claims accepted Number weekly compensation claims Average cost per claim. While the comparisons with the total ACC Work Account and all accredited employers results are interesting, the results will reflect the risk profile of the total universe and not of the actual employer. The statistics comparing the employer to the weighted LRG are valuable. 6.2 Expand the reporting The report could be expanded to provide more benchmark statistics to employers, both in the ACCPP and others. In fact it could be expanded into a general report issued by ACC on the ACCPP. The fact that ACC does not leads one to question why the ACCPP was not accorded a larger place within ACC. 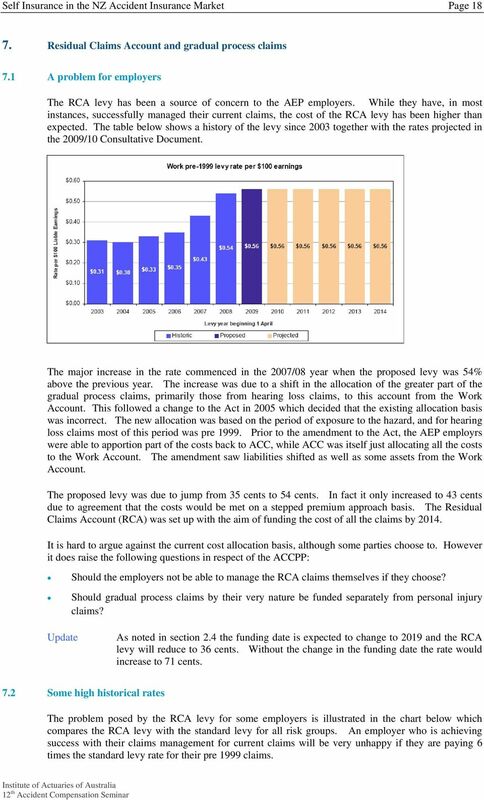 It could be argued that when ACC was renationalised in July 2000, it was accepted that the larger employers had to have in place a self insurance programme but that the ACCPP was then largely ignored. 20 Self Insurance in the NZ Accident Insurance Market Page Residual Claims Account and gradual process claims 7.1 A problem for employers The RCA levy has been a source of concern to the AEP employers. While they have, in most instances, successfully managed their current claims, the cost of the RCA levy has been higher than expected. The table below shows a history of the levy since 2003 together with the rates projected in the 2009/10 Consultative Document. The major increase in the rate commenced in the 2007/08 year when the proposed levy was 54% above the previous year. The increase was due to a shift in the allocation of the greater part of the gradual process claims, primarily those from hearing loss claims, to this account from the Work Account. This followed a change to the Act in 2005 which decided that the existing allocation basis was incorrect. The new allocation was based on the period of exposure to the hazard, and for hearing loss claims most of this period was pre Prior to the amendment to the Act, the AEP employrs were able to apportion part of the costs back to ACC, while ACC was itself just allocating all the costs to the Work Account. The amendment saw liabilities shifted as well as some assets from the Work Account. The proposed levy was due to jump from 35 cents to 54 cents. In fact it only increased to 43 cents due to agreement that the costs would be met on a stepped premium approach basis. The Residual Claims Account (RCA) was set up with the aim of funding the cost of all the claims by It is hard to argue against the current cost allocation basis, although some parties choose to. However it does raise the following questions in respect of the ACCPP: Should the employers not be able to manage the RCA claims themselves if they choose? Should gradual process claims by their very nature be funded separately from personal injury claims? Update As noted in section 2.4 the funding date is expected to change to 2019 and the RCA levy will reduce to 36 cents. Without the change in the funding date the rate would increase to 71 cents. 7.2 Some high historical rates The problem posed by the RCA levy for some employers is illustrated in the chart below which compares the RCA levy with the standard levy for all risk groups. An employer who is achieving success with their claims management for current claims will be very unhappy if they are paying 6 times the standard levy rate for their pre 1999 claims. 21 Self Insurance in the NZ Accident Insurance Market Page 19 Residual Levy / Standard Levy 2009/10 rates 800% 700% 600% 500% 400% 300%. 200% 100% 0% Around 50% of the levy groups have an RCA rate of 100% or less of the standard levy and 50% are above the 100% rate. While the RCA is due to be fully funded by 2014, because of the level of under funding of the account and the consequent levy increases required, the date is expected to be moved to Most employers accept the importance of completing the funding of the historical claims. Update Per the Amendment Bill the funding date is due to change to 2019. 22 Self Insurance in the NZ Accident Insurance Market Page Determining the actuarial liability 8.1 Introduction The initial approach taken by some employers when assessing the outstanding cost of future claims was to take the TPA s case estimates for the existing open claims. This made no allowance for claims yet to be made for the cover period and nothing for the cost of reopened claims and no allowance for the chance that the case estimates were understated. 8.2 Approach adopted We adopt the following approach: Take the case estimates supplied Make provision for IBNR and reopened claims in accordance with the factors applied by ACC when taking over the claim liability from an employer. IBNR claims would include any gradual process claims Include a provision for future claims management costs, again in accordance with the ACC factors. We review previous case estimates supplied to see to what extent the figures have eventuated. If actual costs are significantly different to the case estimates, an IBNER provision is made. Details on the ACC re opened and IBNR factors are included in Appendix E. The re opened factors vary by type of claim (either medical or entitlement) and when the last payment was made. The more recent the payment made, the higher the provision. The factors are applied to the closed claims. 8.3 Adjusting the factors for an employer s own experience The issue to be addressed is whether to adjust the factors for the AEP employer s own experience. This can be allowed for in the case of the re opened factors as they are based on the actual claims paid. Whether a further adjustment is required is the question. More difficult are the IBNR factors. It is possible to compare the actual paid figures with those expected based on the tables published by ACC on the development of claims. Adjustments are required to allow for the impact of the surplus in the Work Account. To date we have looked at this relationship to decide whether or not to adjust the IBNR factor. This is a dominant component of the liability in the current cover year and preceding year. It can easily be argued that the claims management cost factor resulting from adopting the ACC factors is too low if the claims were put into a run off state. An illustration of determining an actuarial liability is included in Appendix G. It includes comparison of experience with the alternative of paying the standard levy, a comparison of expected with actual claims paid, details on claims paid by type, nature of injury and largest 10 claims. 8.4 IFRS4 requirements IFRS4 covers insurance contracts and the issue exists whether an actuarial valuation completed to determine employer s outstanding liabilities under the ACCPP should comply with the requirements of IFRS4. This is separate to the issue of materiality. If the liability is to meet IFRS4, then the disclosure requirements will include information on interest and inflation rates adopted. However we would question whether an employer participating in the ACCPP with its own insurance cover is covered by IFRS4. The approach we have taken to date is that the matter is for the auditor to assess. We derive a best estimate of the liability and do not make any provision for a prudential margin. 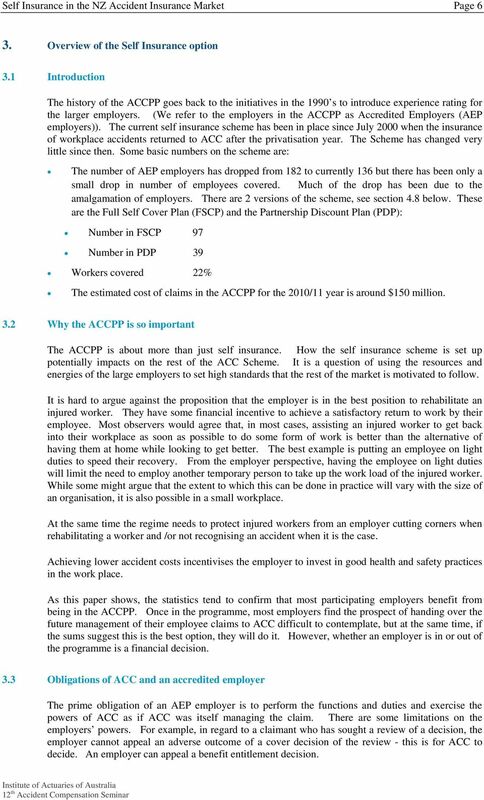 23 Self Insurance in the NZ Accident Insurance Market Page Experience versus ACC 9.1 Introduction In this section we look at the statistics that are available to compare the ACCPP with the standard employer experience and the work MJW completes for clients in this area. 9.2 ACC statistics Ideally there would be comprehensive official statistics available which provide information to compare the experience of employers in the ACCPP with employers in the standard scheme. There are three statistics in the ACC Partnership Programme Employer Performance Report referred to in section 7 which do provide a comparison. This work may have been a response to the third recommendation of the Tripartite review. Year ending March Claims per $m liable earnings Weekly compensation claims per $m liable earnings Average cost per claim $'s Work Account ACCPP Work Account ACCPP Work Account ACCPP ,336 1, ,374 1, ,472 1, ,522 1, ,437 1, Commenting on the table: The Work Account results exclude any AEP employers The average claims costs ignore future costs and is just the cost of claim payments made to date The frequency of claims is consistently lower for the Work Account Similarly, the number of weekly compensation claims is lower in the Work Account However the cost of an average claims for the ACCPP is lower The claims shown are total claims covering both medical and entitlement claims. However the above results do not take account of the risk profile of the AEP employer. In the reports to employers published in December 2008, ACC does compare the AEP employers results against the risk rated LRG results, allowing the employer to see how their performance compares with a similar risk rated group of employers. It would therefore be possible for ACC to provide this figure on a total comparison basis. Statistics from the South Australian scheme show the cost for self insured employers is 35% less than under the fully insured scheme, a sizeable difference. We are not aware whether this is on a risk rated basis. 9.3 Own research We explored this further by reviewing the actuarial valuations we completed for clients in the 2008 year. 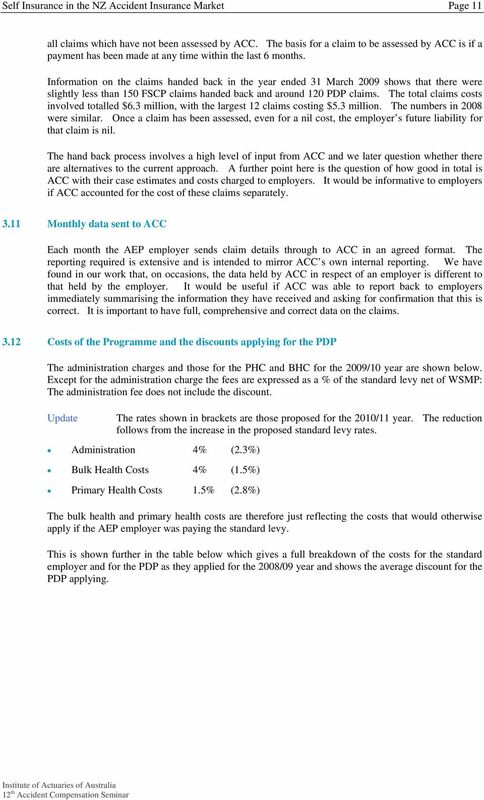 In our reports we include a table which compares the costs to the employer under the ACCPP with the cost if they had paid the standard levy net of the applicable WSMP. The costs include that of either employing an external TPA or having this function performed internally. It would be natural to expect the results to vary by size of employer so we split up and divided the employers into 3 groups based on the standard levy payable. 24 Self Insurance in the NZ Accident Insurance Market Page 22 The tables below show results for each of the cover periods since inception for the 3 groups of employers. The results have been adjusted to eliminate the impact of the surplus in the Work Account. We note: The large employer group has the best results with an average cost of 68% compared to the standard levy The worst results are from the medium employer group The results for the large employer group have remained reasonably consistent over the period. In contrast, the results for the medium and small employer groups have deteriorated over the last 2 years. Total Costs as % of Std Levy net SMP Partner Size 2000/ / / / / / / / /09 YTD Total Small 47% 49% 68% 95% 112% 84% 118% 105% 115% 86% Medium 82% 76% 81% 115% 129% 91% 89% 101% 104% 100% Large 72% 75% 74% 61% 51% 69% 58% 69% 92% 68% Commenting on the results further: The sample of employers is smaller than we might have liked and so the results need to be treated with some caution. The basis adopted to derive the results is intended to be on a best estimate result and so does not include any margins. Despite the comment above, the more recent results will almost certainly be rather more conservative as a higher percentage of the costs are estimated and there is necessarily some element of conservatism in the basis. The administration costs for the employers vary as follows: Less than 10% for the larger employers 20% for the smaller employers 15% for the medium employers. An important factor here is that we would always expect the results for an employer to be better than the alternative of the standard levy for most years In most years the employer is not going to have any major accidents and it is the cost of paying for these which pushes up the standard levy. An average employer would, if their experience over time was exactly the same as that in the standard levy, experience say 9 below average years and 1 very poor year when possibly their insurance cover limits the costs. 25 Self Insurance in the NZ Accident Insurance Market Page 23 To get an indication of this cost we looked at a table published by ACC in their 2008/09 pricing report which shows the projected cost of claims by development year. Development Year Payment Type Total Weekly Compensation Death Benefit Lump Sum Rehab & Other Medical Total An indicator of the cost of large claims is the cost of claims from development year 7 onwards. This will include rehabilitation and medical costs etc for ordinary claims but against this we ought to include the costs of the large claims in development years 1 to 6. The cost from the table is 21% of the total claims cost which suggests that the costs or the larger claims could be around 25%. This would imply that an average employer in an average year should be benchmarking themselves against 75% of the standard levy to assess their own performance. We would expect the AEP employers to have achieved better outcomes than the results available suggest is the case. 9.4 Using the ACCPP performance results to improve H&S for the employer Accident costs have two components, frequency of accidents and severity of each claim. The former is an indication of the H&S regime in place, the latter an indicator of how good the rehabilitation is. What statistics can be usefully provided when the claims data is reviewed? These include: Dollar costs by development year for each cover period Number of claims split by medical only and entitlement claims Duration of claims Comparison of costs by injury type by operating site or division Comparison of costs by cover period Delay in reporting accident and when it occurred. The above can be supplied comparing different cover periods. What would be useful is if ACC was able to supply some benchmark statistics. An outcome would be that an employer could then judge whether or not they should be in the ACCPP and if they are, how they are doing and how could they improve. While the claims administrator will report regularly on the cost of claims, the actuarial review provides an opportunity once a year for these statistics to be carefully reviewed for what they say about worksite safety. An employer who is self insuring will want to ensure that each operating division is allocated its own accident costs correctly. Just allocating all these costs to corporate will not assist the people at the front line who can by their actions make a difference to the accident incident rate. The one difficulty in this area is that allowance has to be made for the cost of large claims in one division. Below is a general overview of Captives with particular information regarding Labuan International and Business Financial Centre (Labuan IBFC). Those who succeeded often received significant amounts in lump sum awards of damages. b. Accident Insurance policy means the Accident Insurance policy arranged under By-law 11.4.5.b.i.